Getting rid of sugar ants is never a simple proposition, despite their simple nature. Sugar Ants are probably the most simple-minded ant species. What do they eat? They eat sugar, sweets, and other scraps of food. This is why we call them sugar ants. Of course, the term sugar ant is actually a misnomer. The real Sugar Ant is a native of the Australian continent, and exclusive to that part of the world; you won’t find them here. 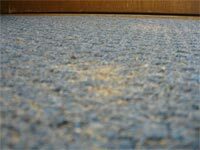 The ants you’re probably having trouble with are Pavement Ants and Pharaoh Ants, and for the purposes of maintaining simplicity in this article, we will refer to both Pharaoh and Pavement ants as Sugar Ants. After all, both ants are controlled and killed the same way: with extreme prejudice usually taking advantage of their appetites. Little black ants have also garnered the name “sugar ant,” though their real name is, well, Little Black Ants. Not a lot is known about Little Black Ants, except that they eat just about anything (including other insects) and they really like rotting wood and dark spaces. 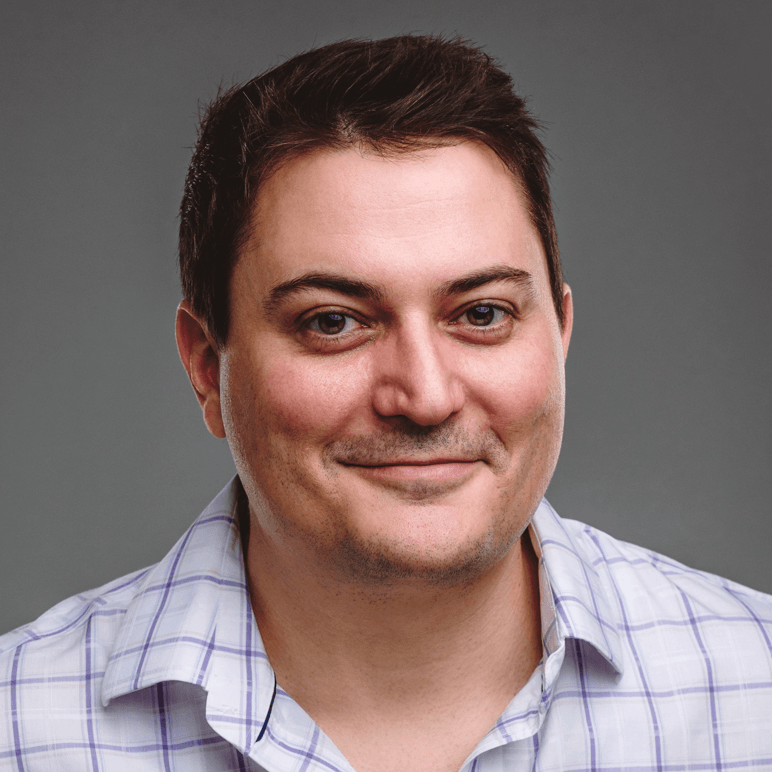 Getting rid of little black ants, however, despite how little is known about them from a biological perspective, is as easy as getting rid of sugar ants. Sweet baits can be used to control little black ants indoors, and protein baits can be used to control little black ants outdoors. Sugar ant control is very much a matter of daily routine during the months when sugar ants are a problem (March through September), particularly in the kitchen. Below is a list of things you can do to control sugar ants and prevent a sugar ant infestation in your home. If you want to control sugar ants, you need to keep your kitchen sink clean and dry. Sugar ants love a dirty sink and the water you leave them to help wash down the leftovers. 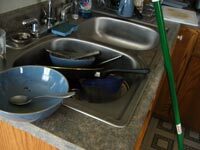 Make sure to rinse out any dishes you’re going to leave in the sink over night. And when you do clean the dishes, make sure you rinse and wipe down the entire sink to make certain you haven’t left residual sweets, food, or moisture behind. If you’re really picky about cleaning, you might even want to try pouring a little bleach down the drain to make sure the smell of rotting food doesn’t attract more ants to your kitchen. Dish drains should also be emptied and wiped down befor the end of the day. Wipe down kitchen counter tops with bleach each night to get rid of sugar ants. Sugar ants love a dirty countertop almost as much as they love a dirty sink. I can’t count the number of times I’ve spilled a few crystals of sugar (for my morning coffee) from the sugar cup on the counter, only to find I’ve fed an entire colony of ants the next morning. 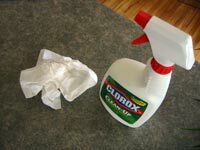 Wiping your countertops with bleach will not only help sanitize your kitchen, but bleach breaks down the pheromones that ants use to follow each other to sources of food. 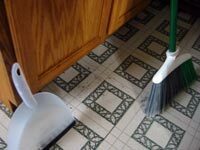 Sweep and mop your kitchen floor with bleach every night during the summer to control sugar ants. I worked in a large kitchen long enough to know that it is in your best interest to sweep and mop your kitchen floor after every meal, or at least once in the evening to make sure any pheromone trails a scout sugar ant has made aren’t left for other sugar ants to follow. Scraps of food and residual sugars are easily swept away with a bucket of warm water and bleach. Vacuum the floors of spaces where food is regularly consumed to avoid inviting sugar ants into your home. It might seem like common sense to vacuum your dining and living rooms to prevent sugar ants from feasting on the leftovers of your most recent meal, but people just don’t get it. So, I thought I’d mention the fact that sugar ants don’t just eat sugar and sweets, they will eat crumbs of bread, certain types of vegetables and meat as well, even the remains of other pests that could be hiding in your carpet. Make sure you get all this stuff off your carpet if you want to get rid of sugar ants. Use strong garbage bags and take the trash out regularly to avoid sugar ant infestations. 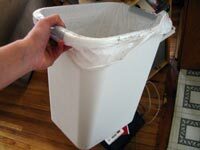 It’s often the case that a garbage bag gets punctured, dripping fruit juice or some other kind of liquid onto the floor while you’re taking out the trash. Make sure to use strong garbage bags, even garbage bags that use Arm & Hammer baking soda to deodorize themselves, if you want to prevent a sugar ant infestation. It should go without saying that taking out the trash on regular basis will reduce the chances of sugar ants finding their way into your kitchen. Use this to clean instead of bleach is a good way to naturally control sugar ant invasions. Acetic acid, the acid in vinegar that makes it smell so strong, not only naturally deodorizes (or odorizes, as the case may be), but is one of nature’s most powerful cleaning agents. 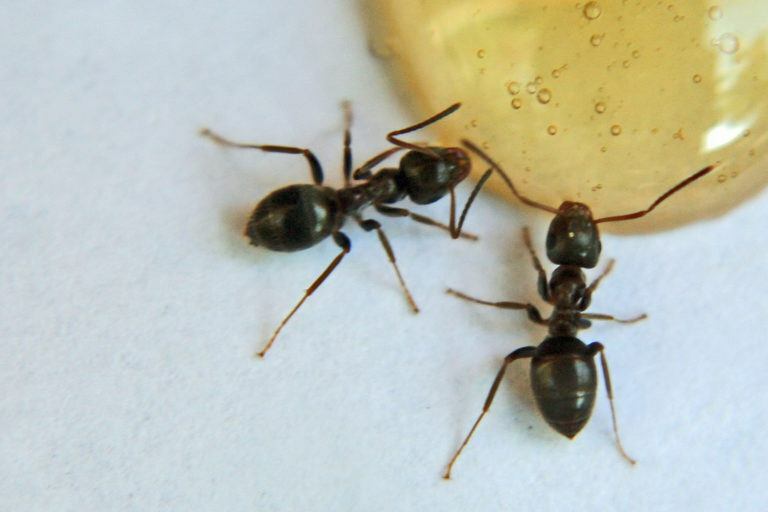 We recommend using vinegar instead of bleach on How to Clean Things all the time, and nothing can be more repulsive to sugar ants than a little white vinegar. Make sure you use White Vinegar, and not apple cider vinegar or something like that. The less sugar the better. These are apparently a good way to repel invading sugar ants. Whole cloves have been used to help prevent infestations of all sorts of insects. I imagine it is the compounds that produce the strong smell in cloves that many pests do not like, but then, I’m not a biologist like Eric, so I wouldn’t know. Suffice to say that if you leave some whole cloves laying around the house, especially along baseboards and under counters, you will probably have less sugar ants scurrying about–and perhaps a better smelling home, if you like cloves that is. These leaves are another one of those natural home remedies to control sugar ants that I haven’t tried yet, but a few of the chefs I’ve worked with in camp kitchens say that Bay Leaves do in fact keep ants away. Usually they will put them under countertops where food is prepared and near entrances where ants are likely to come in. If you want to give it a try, let me know if it works for you. To help with this, you can order a full pound of Bay Leaves at Amazon. It’s significantly less expensive than buying the little bottles.